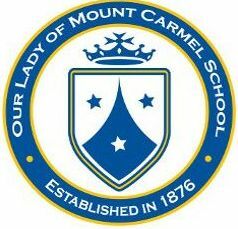 Welcome to Our Lady of Mount Carmel, a nationally recognized Blue Ribbon School of Excellence. We are a Catholic elementary school committed to proclaiming the good news of Jesus Christ, our foundation and inspiration. At OLMC School, students are genuinely engaged in the pursuit of learning. Through the exploration of ideas and the development of a spirit of inquiry, students learn to formulate problems and to design the tactics and strategies to solve them. Teachers strive to awaken in students a sense of wonder and to provide them with opportunities to develop their imaginations. Our Lady of Mount Carmel seeks to educate the whole child through its strong academic program and to enrich the total person through co-curricular and extracurricular activities. The family is viewed as an integral part of our school community and interaction between parents, teachers and administrators is considered an essential element. Please feel free to browse our website to learn more about our programs and our commitment to Catholic education. We hold open houses at regular intervals and tours are available at your convenience. We love to show off our fine facilities, experienced faculty and staff, and extensive technology services. If you have any questions, give me a call!